Respondersafety.com is honored to name a professional such as Alvin as DOT page editor. Alvin Marques, began his career with Maryland State Highway Administration in 1981 as an engineering associate conducing traffic studies. During his tenure with SHA Alvin has worked in the Accident studies Division and District 3 traffic engineering office. In 1989 Alvin was an early volunteer participating in Maryland’s first Traffic Operations Center established to coordinate and manage traffic activities in the Washington Metro area. There he served as both a responder and dispatcher. As the program grew he became the center supervisor and later Operations Manager. Alvin currently serves as Deputy Director of Operations for the Maryland State Highway Administration’s Office of CHART and ITS Development overseeing the Incident Traffic Management Program. Alvin helps coordinate continuity between Maryland’s all hazards emergency transportation planning and regional partners. 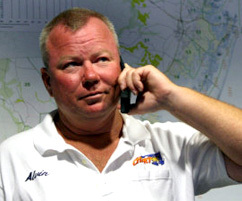 Alvin serves on a number of projects committed to incident management at the state, regional and national level. These include I-95 Corridor Coalition, Federal Highway Administration, NCHRP panels and as a member of National Fire Protection Association Technical Committee (NFPA 1091), Standard on Traffic Control Incident Management Professional Qualifications.